We all know that we’re supposed to be doing major teshuva right now in these final days leading up to Yom Kippur. But until last night, my understanding of this “major teshuva” was little more than a vague, sort-of nauseating feeling of regret for this and that, and a vague, tentative hope that I will have fewer misdeeds on the wrong side of the scale when Yom Kippur 5773 rolls around next year. And then I heard this week’s pre-Yom Kippur class of Rabbi Aryeh Nivin’s Personal Development Chabura, and he gave us some simple but life-altering pre-Yom Kippur homework. 1. Admit a wrongdoing: This year I wasn’t as nice as I should have been to one of my children. This child might have acted badly, but my reaction on a pretty regular basis was overly critical and harsh. 3. Commit to a plan: I commit this coming year to being a 1% better mother. 1% kinder. 1% more patient. 1% calmer. 1% more giving. 4. 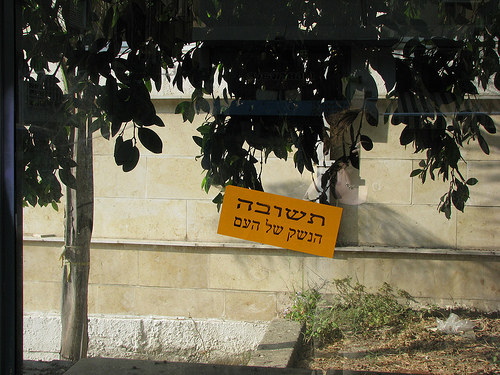 Verbally confess your wrongdoing to Hashem: Dear Hashem, I regret the way I treated my child. Please help me this year to be a better mother to that child and to all of my children. One important note: the Chidushei Harim warns that when going through these 4 steps, don’t wallow around for too long in the depressing regret step. The 2nd step should be like a springboard. Jump onto it for a just a little bit in order to propel yourself to a true commitment to self change for the future. Rabbi Nivin guaranteed that following these 4 steps will have a revolutionary effect on your Yom Kippur. So, Jewish mom, now it’s your turn. Happy New Year and Happy Teshuva-ing! *If you are doing teshuva for something you did that hurt another person, I’m not sure whether these four steps are sufficient. Please ask your rav. This Week's Mommy Peptalk: Vanilla Pudding for Mom, Too! Busy with Kids this Yom Kippur? Read This! Thank you – very helpful to read just now. Especially appreciate the “1%”, which allows for just that small rung of aliyah without so much pressure (much more likely to succeed this way), and the not wallowing in depression – i.e. MOVE ON! #4 verbally confess the wrongdoing to Hashem. aren’t we supposed to confess and ask forgiveness of the person we hurt? Rishe, UR right! Love this site. keep the articles coming! what if we know the nisayon is too hard, and we know we will fail it again and again? What if I am too caught up in all that is being done to me, and I know can’t change my reaction? I want to apologize for making her feel bad, but just as she isn’t going to change, I am not going to, either. Is it wrong to say “I wish it didn’t matter to me, and I wish it didn’t make me feel this way, but it does. I am sorry it hurts you.”? My teacher Rabbi Aryeh Nivin was just addressing this question. If you can even slightly improve your behavior, then that’s also acceptable. Committing to get angry 9 times a day instead of 10, for example. In your case, maybe there is a way that you could even slightly improve your reaction? To react angrily, but at least without yelling or insulting this person, for example?